Of course, what jumps out immediately is the UK. Brexit schmexit…the FTSE’s performance is actually bang in line with long-term averages! Which reflects its predominantly international exposure, but the much-cited FTSE 250 certainly wasn’t much of a disaster at (6.6)%, while the AIM All-Share managed to limit its decline to (4.2)%. [Sterling took the real walloping, trading down 10-12% vs. the dollar & euro]. Unfortunately, this is a sad reminder the real risk of home bias for investors may not be portfolio return. It’s the fact they wake up to a shrinking portfolio…and suddenly realise their currency’s dumped, their housing market’s locked up (& their house value’s probably dumped too), not to mention their employment & economic prospects may also have dimmed substantially. [At least Brexiteers won’t notice the currency impact, since they seem to think only in terms of Mighty Blighty & The Pahhhnd In Your Pocket]. Only a fool would question (or ignore) the benefits of greater/global diversification in the face of such potentially existential risks – particularly as there’s no obvious long-term cost(s) to such a strategy. At first glance, Europe has borne more of the Brexit brunt, with the Bloomberg Euro 500 significantly trailing the UK indices – down over 10% (which must delight the Brexiteers!). However, it’s worth noting escalating NPL/capital issues in the Italian banking system (& a mounting EU-Italy war of words) have been overlooked by the media recently (hat tip to The Economist though)…I suspect this is responsible for a significant portion of the index decline. Despite efforts to date, this crisis will require an expensive & long-drawn out resolution, and will probably continue to exert a significant drag on sentiment. Fortunately, it shouldn’t pose any kind of existential threat to the European banking system ultimately, at least for stronger banks & countries…Draghi & the ECB will presumably continue to do ‘whatever it takes’. But the ongoing compression in European banking valuations is puzzling – who the hell wants to bet & sweat over sub-0.5 P/B banks, when the cream of the crop remains on sale at 1.0 times book (or less)?! [And the US banking situation isn’t much different]. Smokin’ the S&P…H1-2015 Wexboy Portfolio Performance! Oh Lord, where did July go..?! I’d hoped to publish my H1-2015 portfolio performance report a week/ten days ago, but I guess the days kinda slipped away – who can fault a bit of fun in the sun, esp. when my portfolio holdings are slowly but surely marching higher (despite all the China volatility & the fact the US market’s totally sucking wind this year). Now, if you’re a regular reader, I recently detailed my (still) developing bubble thesis (Parts I to IV), suggesting an increased focus on large cap stocks (a new global Nifty Fifty) might be more profitable. [Though I’m also v conscious of certain small/micro cap successes in the past 12-18 months – a bar-bell strategy, in terms of market cap, may ultimately prove more compelling]. But in terms of immediate portfolio changes, I hastened to add: ‘I don’t believe there’s any great rush here, necessarily’. Well, that being said…let’s first kick off with some (end-June) portfolio changes! Alternative Asset Opportunities (TLI:LN): TLI had a great H2-2014 run – gaining over 22% (inc. a 2p return of capital), making it my top holding at year-end (at 11.1%). Since then, the insured have enjoyed a real stroke of luck, with just one maturity announced. Not surprisingly, the shares are off YTD in sympathy (reducing my holding, in % terms). But I’d focus on TLI’s portfolio instead – adjusting for minor FX unfavourability, and an additional 2p ret. of capital, TLI’s underlying NAV decline was limited to just 3%. And I see no change in prospects: We’re at the end of a long & painful life expectancy adjustment process (in fact, June NAV inc. a meaningful positive LE impact), and the insured are now 91.5 yrs old on average – maturities will inevitably accelerate (peaking in 2019-20). There’s little financial risk (with an available credit facility, zero debt & cash on hand), and TLI’s focused on regular returns of capital. Sure, we can debate valuations, but shouldn’t lose sight of the big picture – as per the latest results, the portfolio now consists of $132 million in death benefits vs. a current carrying value of $45 million. But owning such a defensive & uncorrelated investment isn’t as compelling a requirement for me today, and I see equally attractive (albeit, more correlated) opportunities elsewhere. I’ve reduced my shareholding accordingly, from 9.1% to 7.0%. [NB: I normally don’t add to individual holdings beyond a 7.5% limit – TLI remains a substantial position for me]. The UK’s AIM market, for example, has enjoyed significantly positive returns in 14 of its last 18 Januaries. This annual love-fest is even more remarkable when you realize the AIM index has declined 17% since its 1995 inception. [Growth and value investors, take note!] My favourite muppets provide a more ludicrous example: Shareholders of US Oil & Gas (USOP:G4) (I’m presuming no new suckers are buying at this point) hailed the new year by immediately buying/running up the price 60% from its yr-end close! Sure, hope springs eternal…but with most USOP investors having lost 95%+ of their investment to date, this kind of new year exuberance is wildly irrational. Investment Opportunity & Crisis Hedge: My investment thesis identified German property as a secular investment opportunity – it’s cheap in absolute terms, the German economy’s perhaps the most resilient in Europe, and Bund yields remain incredibly supportive. I continue to believe this thesis is correct, but actual property & share price gains to date have been mostly enjoyed by the residential sector. [Check out my German property series: Parts I to V]. I also suggested German property might be a good hedge against any further unraveling of the European sovereign debt crisis. Fortunately, sentiment’s improved dramatically this year – it’s interesting to see German residential share prices peak & then trade sideways/lower for much of the year, as investors migrated back into higher risk European exposure. – Demographics: German population growth is broadly neutral, but is experiencing pronounced trends in favour of urban migration, smaller households & increasing floor size per capita. Investor horizons are often limited when it comes to property – they’d do well to note Germany has the largest population in Europe, the 16th largest in the world & Berlin is the EU’s 2nd largest city with 3.5 million inhabitants! – Supply & Demand: Annual housing demand’s around 250-350 K pa, well ahead of housing completions which are now accelerating but only recently bottomed out at 175 K pa in 2009-10. Germany’s second-hand property also trades at a major discount – e.g. in Berlin, existing housing stock can be purchased at a 30%+ discount to new building costs. 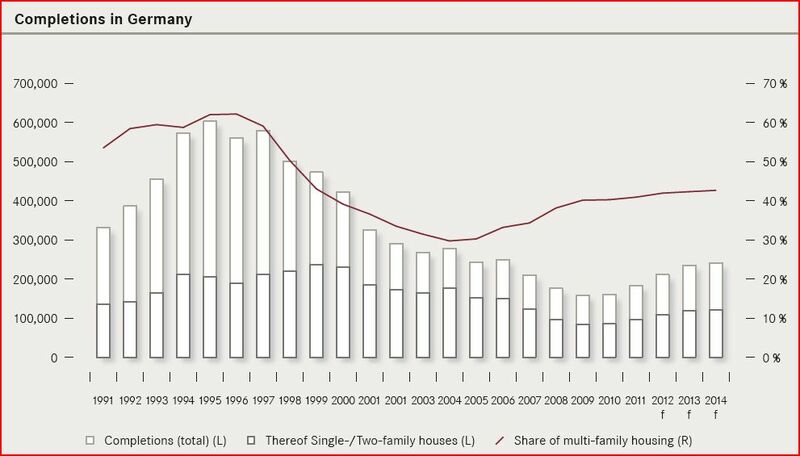 – Home Ownership: German home ownership is a lowly 46%, in stark contrast to the usual Western market rate of 60-65%+. This reflects the government’s long history of housing provision & rent subsidies/suppression, but in recent years authorities have increasingly opted for privatisation. Couple this with rising prices & rents, plus the desire for a safer long-term investment alternative (vs. equity/bond markets) – I think we can be confident of a slow & steady convergence towards Western home-ownership levels. There was a gratifyingly large surge of page views yesterday checking in on my 2012 Portfolio Performance! I’m suitably humbled by the attention – gulp, makes me wonder what challenges 2013 will throw up?! Hopefully the blog’s sparked a few decent ideas & stock picks for you in the last year or so, and you’re pleased with the progress of your own portfolio in 2012. It’s certainly been rewarding for me – most obviously in terms of improving my investment focus & analysis, but also in terms of the constant stream of questions, challenges, feedback, gossip, ideas, etc. from blog readers. – The start of a new year really means little to me, I don’t suddenly discover I have whole new batches of stocks to buy & sell! – I rarely write about stocks I don’t own. This is pretty deliberate – my intention was never to simply fill up blank space with an idea each day/each week. I think people can really only judge your level of analysis & conviction against whether you actually own a stock – and, of course, by how much stock you own! – I also don’t write about stocks I track, or discard, very much. First, mostly because they’re far too numerous! Second, I’m not sure I’d always manage a proper (in-depth) write-up about such stock(s). And third, I’ve sometimes tracked stocks every single day for literally years on end before buying – how often do you want to hear about them? !